In South Africa there is little data on environmental pollution of rural water sources by agrochemicals. This study investigated pesticide contamination of ground and surface water in three intensive agricultural areas in the Western Cape: the Hex River Valley, Grabouw and Piketberg. Monitoring for endosulfan and chlorpyrifos at low levels was conducted as well as screening for other pesticides. The quantification limit for endosulfan was 0.1 μg/L. Endosulfan was found to be widespread in ground water, surface water and drinking water. The contamination was mostly at low levels, but regularly exceeded the European Drinking Water Standard of 0.1 μg/L. 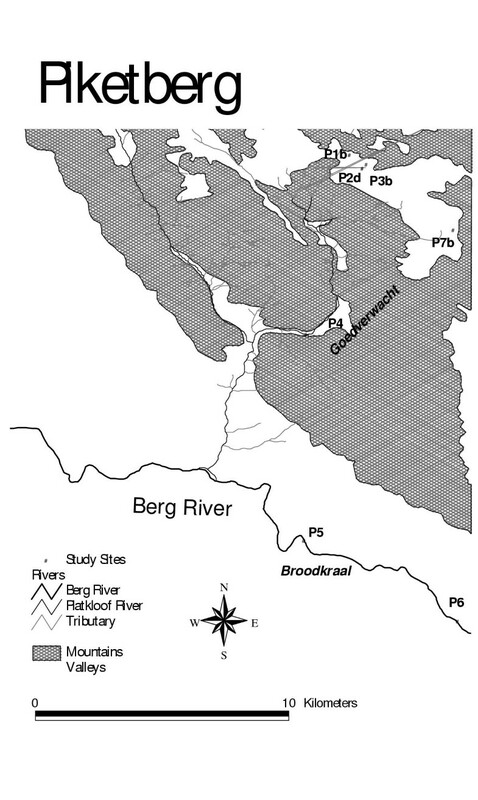 The two most contaminated sites were a sub-surface drain in the Hex River Valley and a dam in Grabouw, with 0.83 ± 1.0 μg/L (n = 21) and 3.16 ± 3.5 μg/L (n = 13) average endosulfan levels respectively. Other pesticides including chlorpyrifos, azinphos-methyl, fenarimol, iprodione, deltamethrin, penconazole and prothiofos were detected. Endosulfan was most frequently detected in Grabouw (69%) followed by Hex River (46%) and Piketberg (39%). Detections were more frequent in surface water (47%) than in groundwater (32%) and coincided with irrigation, and to a lesser extent, to spraying and trigger rains. Total dietary endosulfan intake calculated from levels found in drinking water did not exceed the Joint WHO/FAO Meeting on Pesticide Residues (JMPR) criteria. The study has shown the need for monitoring of pesticide contamination in surface and groundwater, and the development of drinking water quality standards for specific pesticides in South Africa. As water pollution by pesticides can affect many biological systems, the widespread use of potentially harmful pesticides has recently come under scrutiny in South Africa [1, 2]. Once contaminated, the groundwater may take a long time to clear  and there is always the danger of bioaccumulation. Expenditure on agrochemicals has increased markedly over the past decade  and a far greater variety of chemicals are used locally compared to other developing countries [5, 6]. There is, however, little environmental monitoring of pesticides . Pesticide exposures are associated with a growing number of chronic health effects [8, 9], with local farm workers being at particular risk due to unsafe application methods  and adverse living and working conditions . While concern for water pollution by pesticides has mobilised considerable resources in other countries, particularly in the developed world, little research has been undertaken in South Africa . Available literature [12–17] reports the presence of a number of pesticides in rivers and dams. In the Western Cape, Davies et al. detected six pesticides in Elgin dams and three in Caledon dams, with endosulfan present in 26 of 27 Elgin dams at concentrations as high as 626 μg/L. Recently, Schultz et al. found increased endosulfan presence in the Lourens River after washout during the first rains. However, no contamination was found in a study undertaken in the Hex River Valley,  probably due to the use of monitoring equipment with high detection limits. (Personal communication, Dr John Weaver, Watertek, Sept 1995). The aim of this study was to investigate pesticide pollution of water supplies in agricultural areas of the Western Cape, South Africa. 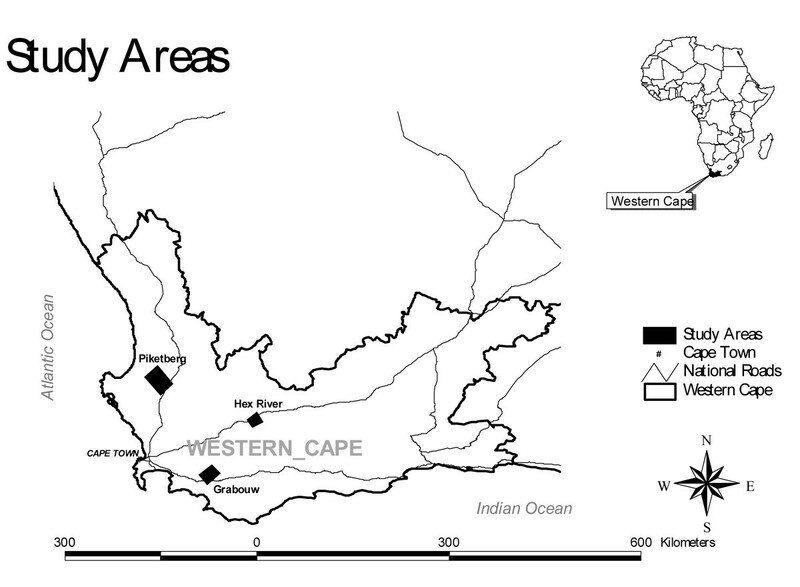 The objectives were to identify rural water sources in the Western Cape at high risk of agrochemical contamination, to identify and quantify the presence of agrochemicals at these selected sites and to explore the implications for human health. For assessment of the possible chronic health and environmental effects of long-term exposure to pesticides, extended monitoring of ground, surface and drinking water, as well as analytical techniques with sufficiently low levels of detection are essential. Identification of areas with the potential for water contamination by pesticides was conducted through review of secondary data, interviews with rural health care providers, farmers, environmental officers and other agricultural personnel and field observation. Access to sites was negotiated with local agricultural organisations and assistance was sought from geohydrologists to identify areas and sites most vulnerable to pesticide contamination. Three intensive agricultural districts, Piketberg, Grabouw and the Hex River Valley were selected as study areas (Figure 1). All three areas have a Mediterranean climate with winter rainfall. The Hex River and Piketberg districts are semi-arid (receiving < 300 mm rain per year), while Grabouw is in a high rainfall area (> 400 mm per year). Grape farming is practised in the Hex River district (Figure 2). The most important source of water for drinking and irrigation is a mountain dam. Soil conditions are conducive to pesticides reaching the water table and contaminating groundwater (water table < 1 m, unconfined aquifer, coarse soils with low clay content) . The Grabouw district (Figure 3) includes two pomefruit farming areas (Grabouw and Vyeboom). In both areas, the soil is complex but generally promotes run-off to surface water sites . The high annual rainfall tends to encourage run-off. Piketberg (Figure 4) is an important farming region covering a much larger area than the 2 other study districts. Fruit farming is practised on the Piketberg mountains and wheat farming in the valley. The soil in both areas is multi-textured, but generally leachable and prone to run-off . The water table is moderately shallow (< 5 m). There are substantially more wells in this area than in the Hex River and Grabouw. The Berg is the major river running through the area and water is purified for domestic consumption at a number of places along its course. The purification scheme at Wittewaters is a major source of drinking water in the rural Western Cape and is fed by the Misverstand Dam, situated amidst extensive wheat farms, where aerial spraying of pesticides is commonly practiced. The Berg River, flowing through fruit farming areas also flows into the Misverstand Dam. Sampling sites in the three areas, summarised in Table 1 and shown in Figures 2, 3, and 4, were chosen to provide a spread of ground, sub-surface and surface water. Some sampling points were added in the course of the study to enable a better understanding of contamination patterns at the different sites. Closed surface drain (1 m); drains vineyard run-off from farm and from neighbouring farms. Farm dam, water pumped from Palmiet. Dam receiving water from Palmiet river, other dams and irrigation run-off; purified for domestic use. A stream flowing from agricultural area in Vyeboom into the Theewaterskloof Dam (supplies just over 50% of Cape Town's drinking water). The stream is part of the dam when the dam is full. Stream running down the mountain from P2d through Moravian Mission and into the Berg River. Used for domestic consumption. Well (depth = 100 m) on wheat farm on the plain below the mountain. 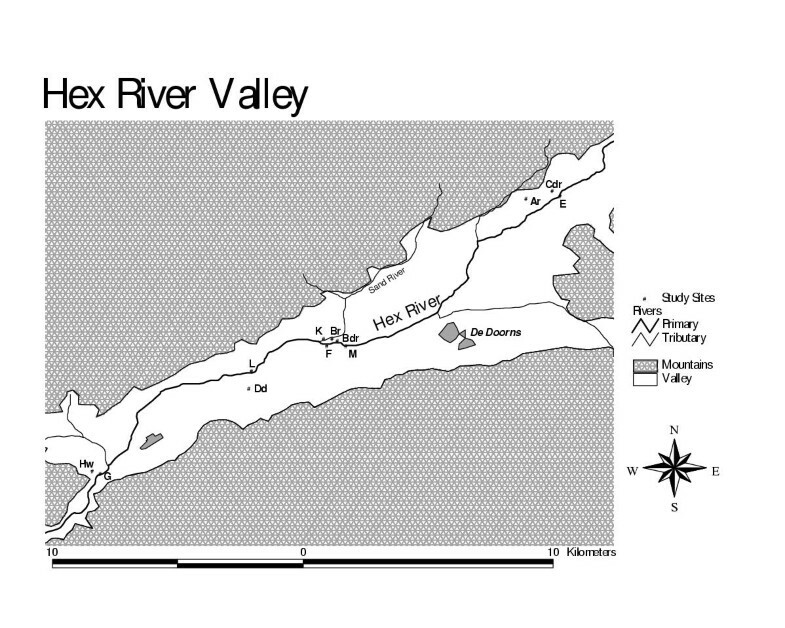 Sampling sites in the Hex River region were along the Hex River. The two sub-surface drains (Bdr and Cdr) eventually feed into the Hex River. Grabouw/Vyeboom sites were selected on farms belonging to one of two major apple-packing co-operatives in the region. Unlike the other 2 areas, in Piketberg sampling access to farms was arranged by the local environment officer, who is the municipal official responsible for public health functions in rural areas. Grab (manual) samples were collected by the project co-ordinator (A.D.) commencing February 1998 in the Hex River, April 1998 in Grabouw and May 1998 in Piketberg, and completed for all 3 areas in May 1999. Samples were collected once monthly in each area on a rotating cycle, and twice in the week after the first rainfall trigger (> 10 mm over 24 hours or > 15 mm over 48 hours), using a standardised procedure (the same method each time). Although an attempt was made to take dam and river samples as far away from the bank as possible and submerging sampling bottles about 1 m deep, this was not always possible due to problems with access and shallow water levels. Samples were collected directly in clean, dry, 2.5 and 1 L amber glass bottles fitted with a screw cap lined with clean aluminium foil. Samples were kept at ambient temperature in a holding box for transport to the laboratory where they were stored in a refrigerator until extraction. 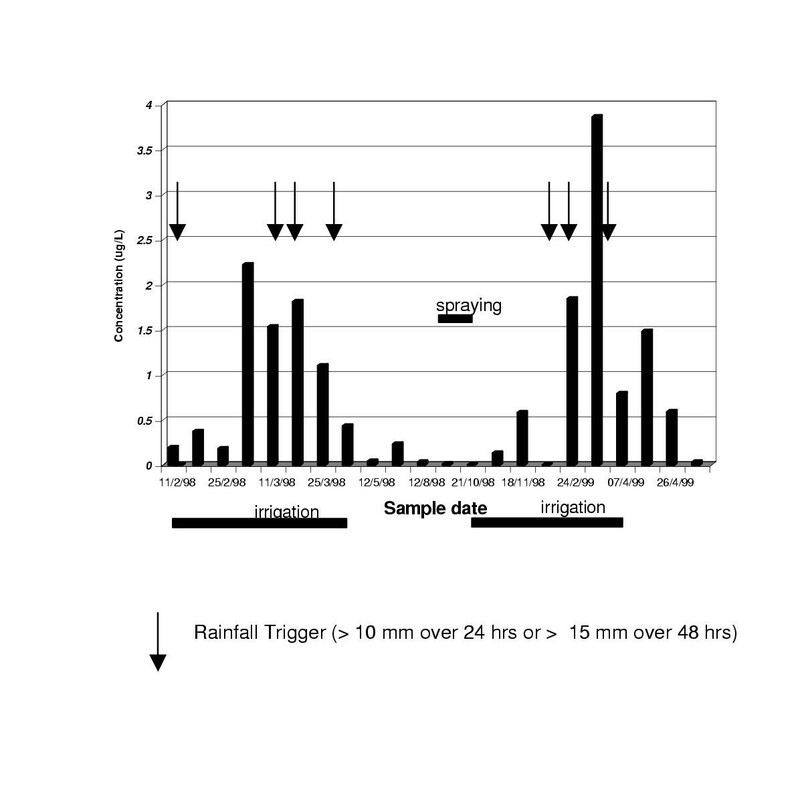 Sample pH, water temperature, subjective assessment of water level (low, medium or high) and the occurrence of spraying within 1 km of the sampling point were recorded (These results are not shown because they did not add to the interpretation of the findings (See London et. al. ). Not all pesticides could be monitored due to the prohibitive costs of multi-residue screening methods. Instead, a comprehensive list of pesticides used in the three areas was shortened  to thirty-one pesticides for analyses, conditioned by the availability and existence of local methods for analysis. Analyses were conducted jointly by the Analytical Chemistry laboratories of the Peninsula Technikon (PENTECH), which was the project laboratory, and the State Forensic (SF) Laboratory, both of which are in Cape Town. The SF undertook analyses conducted as a battery for all thirty-one pesticides (quantification limit, 0.1 μg/L) in line with their statutory function of providing a screening service for monitoring of pesticide residues in food. Based on their preliminary results and on anticipated findings, PENTECH developed methods to analyse five pesticides, including endosulfan (isomers I and II and endosulfan sulphate), BHC. DDT, dichlorvos and chlorpyrifos. Iprodione, azinphos-methyl, prothiofos, deltamethrin and fenarimol were detected on six occasions at low levels at ten different sites , whereas chlorpyrifos and endosulfan were detected on screening by either the State laboratory, or the Agricultural Research Council Laboratory (ARC) on a number of occasions. Consequently, PENTECH focused on investigating analytical methods for chlorpyrifs and endosulfan. The results for endosulfan, a commonly recognised endocrine disruptor [19, 20], are presented in this paper. The results for the other pesticides did not change the overall findings of the study. PENTECH used solid phase extraction following EPA methods [21, 22]. Samples, which were vacuum pre-filtered through S&S filter paper (ref. No. 334508) were extracted within seven days of collection (more than 80 % were extracted within three days) using Bond Elute Extraction Cartridges (C18, 10 ml LRC, 500 mg sorbent mass). The column was conditioned with 2 volumes (2 – 10 ml) of ethyl acetate, and 1 volume each of methanol and deionised water. High-pressure chromatography grade solvents were used. 250 ml of filtered sample was column aspirated at 20 – 25 ml per minute under vacuum. The column was then washed with one volume (10 ml) deionised water and thoroughly dried for 15 minutes under vacuum. Pesticides were eluted into a borosilicate glass vial with 2 × 10 ml ethyl acetate which was then left to evaporate at room temperature. 1 ml hexane was added to dissolve the residue, for GC analysis. Standards were prepared from analytical standards (> 98% purity) [21, 22]. Gas chromatography was used for identification and quantification of extracted samples using a Varian 3300 GC with an electron capture detector (ECD). A 2 μl sample was injected onto a capillary column with a BPX 5 stationary phase. The temperature was increased from 170°C at a rate of 7°C/min to 290°C and held there for 5 minutes. Injector and detector temperatures were 250°C and 300°C, respectively. • Duplicate sampling and analysis of one site at least once per sample run. Duplicate samples were run after eight samples had been injected. • A reagent blank and a laboratory control sample (LCS) run with each set of samples. Both were subjected to the same analytical procedure as those used on the study samples. The LCS was spiked with the target analytes at a concentration range expected for the samples in deionized water. • Recoveries < 70% or > 130% for LCS prompted investigation and, if necessary reanalysis. • Mixed standards injected prior to a sample run and at the end. Peak shape, resolution and response evaluation by comparison with previous chromatograms was done to ensure optimal performance of the entire analytical system. Quality Assurance was with the GLP-accredited Agricultural Research Council (ARC) and SF laboratories. Eleven (4 Piketberg, 2 Grabouw and 5 Hex River) samples sets were forwarded to the SF laboratory and two (Hex River) to the ARC, including one (Hex River) set to both laboratories. One set each to both laboratories included a duplicate sample of Bdr, with one falsely labelled (I). Additionally, all three laboratories analysed a set of seven samples from Bdr (Hex River). Samples for the SF laboratory were stored at 5°C and sent within 24 hours, while that for the ARC were couriered in polystyrene containers. The SF laboratory used solid phase and the ARC liquid-to-liquid extraction. The ARC laboratory used a 2 m 3% OV-17 column and the SF laboratory, a DB1 column. All three laboratories use GC methods with Electron Capture Detectors (ECD) but with different columns and temperature programmes. This served to confirm pesticide identification. No confirmation with another detector was possible at PENTECH because of the lack of a second detector. The results of the QA analyses , suggested that the laboratory analytical procedures followed in this study were able to achieve adequate precision and inter-laboratory agreement, consistent with normative practice for such strategies. The quantification limit (empirically-derived quantification limit = 2 x Std Deviation of 7 samples of low concentration of respective standard for endosulfan analyses) at PENTECH was 0.1 μg/L (Table 2). Endosulfan data are quoted as the sum of isomers I and II plus endosulfan sulphate, unless otherwise specified. Endosulfan concentrations are expressed as μg/L, because of the different molecular weights of the isomers and endosulfan sulphate. Table 3 lists and summarises endosulfan levels and the number of detections in the Hex River region. Bdr, the drain that receives sub-surface run-off from a number of different farms, consistently produced the highest detections. There were virtually no detections in the other drain Cdr, which dried up completely towards the end of the study. The dam (Dd) had little contamination before September 1998, but consistent detections thereafter. This might have been due to the decreased water level resulting from irrigation, thereby concentrating chemicals released from sediments, especially endosulfan, with a soil half-life of 120 days and sorption coefficient (Koc) of 17.52 L/g . This explanation was, however, not supported by evidence of any significant pH changes in the dam water due to chemical release. The detections did correspond temporally with endosulfan spraying in the region. Both reservoirs (Ar and Br) were erratically contaminated, generally at low levels. 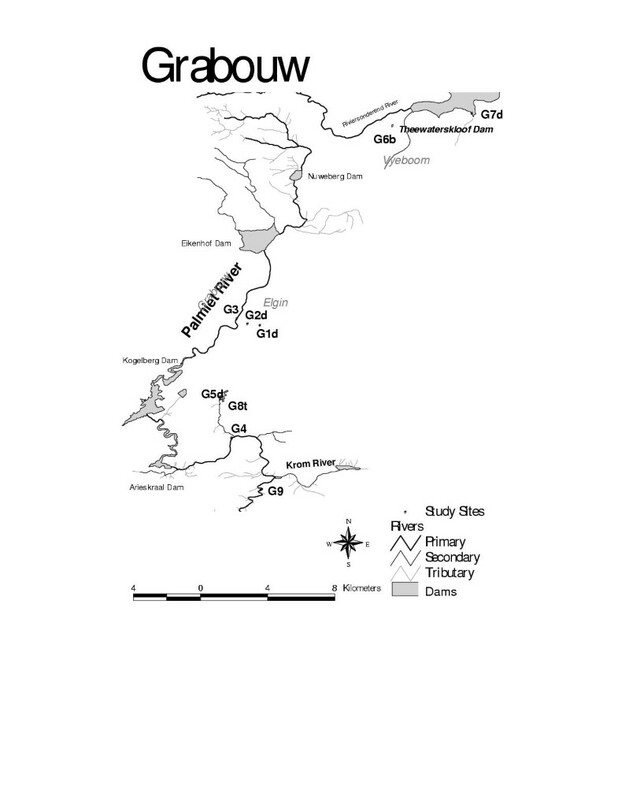 River detections (points E, F and G, Table 3) appeared to peak in mid-valley (F) and to be diluted in the lower valley (point G) after confluence with a tributary. However, point L, which lies between F and the confluence point, had similar levels of pesticide as G, suggesting that dilution occurs before L. Site L was, however, sampled only four times. There were no obvious point sources (e.g. pesticide mixing stands) identified along the course of the river (although a mixing stand was sited some 30 m from the river at L). No inference could be drawn on site K, lying on a river that joins the Hex River, because it was sampled only three times with endosulfan detected in one sample. Detections during the spraying months, September to mid October (endosulfan sprayed 1–2 times during this period), were low in all the sites. Subsequent irrigation (September to May), especially during January to March (about 125 mm per month), appeared to be associated with enhanced detection because higher endosulfan levels were found during February to April 1999 at most sites. Raised levels were also found in F and Bdr during the same period in 1998. Raised levels during January-April could also have been due to rainfall triggers on 10,16 February; 7, 22 March and 21 April in 1998 and 9, 17, 25, 27 January and 9 and 19 March in 1999. There were detections in drinking water sources (H) and (J). In summary, low-level endosulfan detections were widespread in the Hex River region. Bdr and F (the mid-point of the river) were clearly "hot-spots" with regularly higher levels than other sites. Of the three mechanisms which could explain pesticide movement (rain washout, irrigation washout and spray activities), irrigation and rainfall washout appear to be the most important although there is some temporal relationship to spraying. The effect is demonstrated in Figure 5 showing endosulfan detected in Bdr. Table 4 presents total endosulfan levels for Piketberg, and also provides a summary of the detections. There were detections in all sites, mostly during the irrigation period of February to March 1999. Many of these sites are used for drinking water (P1b, P3b, P7b, P4, P8t), and include the purification scheme supplying a large area in the West Coast region (P8t). Rainfall triggers (6–11 May 1998 and 18–20 April 1999) did not enhance contamination. Endosulfan in P8t was substantially raised in October 1998, coinciding with peak spraying (one-two times) in surrounding fruit and grape growing areas. Endosulfan levels also peaked in two of the wells (P1b and P7b) shortly after the spraying period, suggesting movement through the soil after application. Endosulfan in the two Berg River sites (P5 and P6) was lower than the Hex River, although one site, P6, was not sampled consistently due to inaccessibility. Higher levels in January 1999 could partly reflect applications upstream in fruit and wine farming areas. Detections in the dam (P2d) on occasion corresponded with those in the connecting stream (P4) lower down the water course. Table 5 presents total endosulfan levels detected in Grabouw, and also summarises the results. Detection of endosulfan in all sites was consistent with the timing of spraying activities on farms in the area, with endosulfan levels being raised in November after the October spray and during January to March 1999 after the December spray. The latter period also corresponds with maximum irrigation practices in the area. Regular trigger rains during May-December 1998 and January, April-June and October-December 1999 also enhances endosulfan levels. The time and level of endosulfan detected in the two sites on the Palmiet River was broadly similar. Table 5 shows that the four dams sampled in the area, were consistently and relatively highly contaminated compared to other study sites. Raised levels in dams were measured well beyond the period of application. pH data did not suggest any mobilisation of sediments. Davies  also previously identified endosulfan as a common contaminant of dams in the Grabouw region. Sites supplying drinking water yielded fairly consistent low levels of endosulfan. Particularly high levels for the dam (G2d) that supplies water to one household were noted. There was also intermittent presence of endosulfan in the stream (G7d) feeding the Theewaterskloof Dam supplying drinking water to Metropolitan Cape Town. Table 6 summarises the number of samples in which endosulfan was detected above the water quality criterion (0.9 μg/L) of the Inland California Surface Water Plan [CAISWP, ], and those above and below the study quantification limit and EEC single pesticide limit (0.1 μg/L), in relation to study area and ground and surface water. Endosulfan was found most frequently in Grabouw, 72 (69%) out of 104 samples compared to Hex River, 85 (46%) out of 184 samples and Piketberg, 37 (39%) out of 94 samples (Table 6). Both ground and surface water sites regularly exceeded the European Community (EEC)  water standard (0.1 μg/L) used universally for all pesticides. Twenty-three percent of all samples (n = 194) exceeded the less stringent CAISWP  water quality criterion (0.9 μg/L). Number of samples in which endosulfan was detected in the three areas sampled, and in groundwater and surface water. The slightly higher frequency of endosulfan detected in Grabouw compared to Hex River and Piketberg might be explained by the more frequent rainfall and the higher levels of spraying with endosulfan during the irrigation period. Although the results are based on relatively few groundwater sites and samples (only five sites in the three study areas, totalling fifty-three samples over the study), detections of endosulfan appear lower for groundwater (23%) compared to surface water (40%). It is also worth noting that the SF laboratory sporadically detected a number of other pesticides commonly used in deciduous fruit farming in both the Hex River and Grabouw/Vyeboom areas. These detections (of azinphos-methyl, fenarimol, iprodione, deltamethrin, penconazole and prothiofos) occurred at times more or less consistent with usage of these agents in the industry, and at relatively low levels (below 2 μg/l) although not as low as detections achieved at PENTECH. However, their presence in the samples adds consistency to the picture obtained and to the construct validity of the overall results. This study shows evidence of consistent low-level endosulfan in rural water sources in the Western Cape and warrants greater attention to establishing mechanisms for pesticide surveillance of water sources in South Africa. That nineteen of the contaminated sites were drinking or domestic water sources is of particular concern. Comparison of the levels obtained to some human health guideline/standard would therefore be important. However, only two endosulfan drinking water standards (EEC, CAISWP) are available, with the EPA, WHO and South Africa currently having no endosulfan standard [26–28]. With regard to aquatic safety the guideline is 0.003 μg/L in Australia  while in South Africa  the chronic effect value is set at 0.01 μg/L and the acute effect value, 0.02 μg/L. Table 7 shows a modelling of daily intake of pesticides for study populations using selected sampling points for drinking water. The modelling assumes two scenarios: a worst case scenario where drinking water concentrations are characterised at the highest concentration detected at the site; and a scenario where the concentrations found at each site are averaged using a root mean square conversion. These are then used to estimate total daily intake of pesticide and compared to published acceptable daily intakes (ADIs)  to calculate a percentage of ADI derived through water consumption. Estimates which were determined assuming that the average person consumes 2 L of water per day and weighs 60 kg, were low when compared to WHO acceptable daily intake. Drinking water intake is thought to pose a health risks if it exceeds 1 to 10% of ADI. Only the peak estimate for the site providing purified water to the West Coast exceeded 10%, while the average estimates of this site was also the only one that exceeded 1%. It is therefore reasonable to infer that these levels are not of immediate concern. However, it should be noted that the calculations in Table 7 do not take account of vulnerable groups such as children who have a higher consumption per kg body weight. ENDOSULFAN: ADI < 0.006 mg/kg bw ; Note: Only results used where recoveries were > 70% and < 130 %; * Daily intake of water for adults assumed 2 L per day for an adult of 60 kg. Nonetheless, thresholds for concern are being continually revised downward as more empirical evidence emerges. The presence of endosulfan, which has class two human toxicity, very high aquatic toxicity  and is a known endocrine disruptor with estrogenic effects comparable to estradiol  warrants attention. A few studies have previously detected endosulfan in water sources [13, 15, 24, 32–34] and the levels found in this study are consistent with the range (0.1–100 μg/L) found in groundwater [24, 32] and surface water  in those studies. Pesticide detections in this study, however, appear to be more frequent than found in previous studies, probably a function of increased frequency of sampling . Endosulfan spraying in Grabouw ranges from 0.5–1.5 kg active ingredient per hectare. The findings in this study contrast with those found by Weaver  in the Hex River Valley in 1990, where no evidence was found for pesticides reaching ground water. However, that study analysed a different set of pesticides, made use of less sensitive analytical techniques and focused primarily on groundwater. Detections in both surface and groundwater (including sampling point H, which was identical in the two studies) were in any case found to be low in this study. However, of importance is that detections are not confined to the Hex River but are ubiquitous in all three study areas. Out of 382 samples, there were 37% endosulfan detections above the EU limit of 0.1 μg/L. Endosulfan has been reported as having a low pollution likelihood , but other factors such as soil characteristics, shallow water tables and intensive spraying [24, 32, 37], could explain its relatively frequent detection in this study. Endosulfan levels in all three areas were the highest and most frequent during January to March, corresponding mainly with irrigation practices, but also with rainfall events. Previously, Domagalski , also found irrigation to be an important trigger for both leaching and run-off events. Recently, Schultz et al. found rainfall washout to increase endosulfan in the Lourens River located in the South-Western Cape (from 0.06 μg/L to 0.16 μg/L), but levels were substantially lower and detections less frequent, than that measured in this study and the effect of irrigation was not measured. Correlation between rainfall and endosulfan detection in our study might therefore have been influenced by irrigation patterns. The reliance on grab sampling was a limitation in the study. Intermittent monitoring may give false estimates of true exposures, or inadequate characterisation of contamination patterns. For example, Domagalski  showed that thrice weekly sampling of surface water in the San Joaquin River Basin was more than twice as likely to identify concentrations exceeding state water standards than single weekly sampling. Efforts to develop methods that sample water sources on a continuous basis, to provide an integrated assessment of water contamination by pesticides, should be explored. Integrated sampling methods are, however, not practical at present. Other limitations in the study include the use of manual grab samples, and the non-measurement of specific conductance and dissolved oxygen due to a lack of resources. The results in the study indicate that monitoring of pesticide levels in South African water resources is warranted, preferably with cost-effective and practical methodologies. The findings also indicate that epidemiological studies investigating the health effects of endosulfan should be undertaken. Furthermore, policies aimed at reducing the potential contamination of water by pesticides need to be developed and implemented. The authors wish to thank the Water Research Commission of the South African Department of Water Affairs and Forestry (DWAF) and the South African Medical Research Council for financial support for this study. The assistance of Tom Robins of the University of Michigan School of Public Health and the Fogarty Centre for International Research Development; Jannie Walters (Wenkem); Chris Dain (Zeneca); Garth Hodges (Agrevo); John Levings (Two a day co-op); Mr Watkins (Mechanical Engineering, UCT); WHO (donated WHO standards); Mr S van Niekerk and J van Zyl (Elsenberg Agricultural College); Mr A Jacobs (Infrutec); Dr O Sisulu and Dr G Joubert (CSIR); John Weaver, Kevin Pieterse and Gideon Tradouw (Watertek); Dr Tawanda Masuka and Mr Munro van der Merwe (ARC laboratories); Kevin Hearshaw (State Forensic laboratory); Hanlie van der Westhuizen; E Truter and M Loubscher (Department of Health, West Coast Region, Malmesbury); Kobus Hartman (UNIFRUCO); Alreta Louw (DWAF) and The Hex River Farmers association is also acknowledged. The authors are not aware of any competing interests. AD co-ordinated the study, assisted with the design, collected data and drafted the manuscript. EC was responsible for the design of the analytical methods, assisted with the design of the study and drafting of the manuscript. LL was the principal investigator of this project, designed and organized the study and assisted in drafting the manuscript. AS was responsible for the laboratory analysis, assisted with data collection and drafting of the manuscript. All authors read and approved the final manuscript.